You are here: Home / Free Pass / Sneak Peek / Musicians’ Most Common Mistakes – Part 4: Rearrange Your Songs for LIVE! This blog and video are the fourth in a series we’ve put together to answer YOUR questions! What are the most common mistakes musicians make in their live show? In video blog #1, we described the first mistake: Your songs don’t all sound the same, but they all look the same. Video blog #2 addressed mistake #2: Misdirection. Mistake #3 blog: They don’t create moments. They play songs. Like I was saying earlier; one of the biggest things in a live show is learning how to arrange your songs to create those moments. Mistake (#4) is: Most people don’t rearrange their songs for live. They go and they play the song just like it’s recorded. Sometimes I get music sent to me (for artists I’m working with) without vocals. Other times I get the completed songs. When listening, I pop on different EQs on my iPod. I get the pop EQ so I hear the vocals. Sometimes, something like a background vocal pops out, that’s so cool. Then I’ll go deep and I roll off all the high stuff so I can hear the low end, the kick drum, the bass, the rhythm…what’s going on down there and I’m looking for specific things in those. I’m looking for the parts that say: “Wow this is so cool”. So, we go into rehearsal and we develop those things. We don’t just play them like they are on the three and a half minute song. We go in and we extend them, we milk them, we change them; there’s a beginning and end.. there’s a payoff to those parts. The key partly is recognizing those parts. That’s what Amy and I do…We find parts. One could be an ‘audience participation’, another could be a ‘cool drum breakdown’, another could be an awesome ‘acapella thing’, another could be a great background vocal where they all come out and sing background. There are all kinds of moments in your song. Amy: A lot of times the bridge will be the coolest part of the song. It’s this long. (Amy indicates a short span.) We love taking that and developing that into something epic. Tom: Yeah. The bridge oftentimes, maybe 20 – 30% of the time, is the coolest part of the song. And, instead people play it, it goes by the audience and they don’t get it. Why not stop there and develop that part. It’s such a funnel that has to get to the top. It’s like winning a lottery. In fact, I think more people win the lottery than have hit songs. So, you’re always trying to write a hit song and I don’t know how many of you watching this have number one songs that people love, but when I get (to work on) the songs, I’m glad to get those songs! But, I listen to the rest of the CD, too. In those CDs there are other songs that are really, really good and there are moments inside them, but they need to be cracked open. I think our job, being honest, is a little easier than writing a hit song because we look for the things inside those songs and develop them. And they’re hit songs live. They’re hit songs “LIVE ”. Here’s a clue: You build your merchandise around those moments that you’ve created because people want those moments. How do you develop merchandise? Maybe someday we’ll read some of the emails from people who send us emails or text us saying their merchandise has gone crazy. Amy: Because they may have taken a line that the audience sang in a fun moment, an audience participation moment and put that line on a shirt. So, what happens is the audience wants to remember that moment so they grab that shirt. “We sang with this song, this is a great keepsake.” So you have to think in terms of those moments. 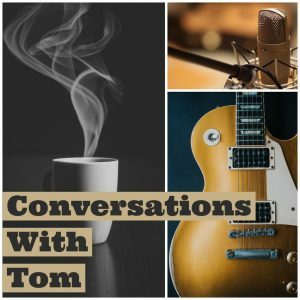 Tom: One idea I’ve done before with quite a few artists is we hear a great rhythm and we develop a whole rhythmic thing where everyone is playing a rhythmic part on a drum, on something else…they’re beating on something. And, we create a cool, little rhythmic thing. And then we created merchandise with drumsticks, with an autograph or just drumsticks on the table and people want to buy those drumsticks to re-live that cool groove/groovy moment. So, that’s one way to build your revenue. But if you don’t create those moments, going back to what is the big mistake, if you don’t create those moments intentionally; you’re missing out on a big boost in your revenue. I’m trying to help you. This is not for me. I’m trying to help you develop. There are so many good artists out there who miss the mark because they don’t do this stuff.